If you’ve been following us, or Bulgari for that matter, you’ll already know that this year is the year of the Octo. From solid gold automatic thinness, to ultra high-tech insides, the record-breaking collection has gone from strength to strength. 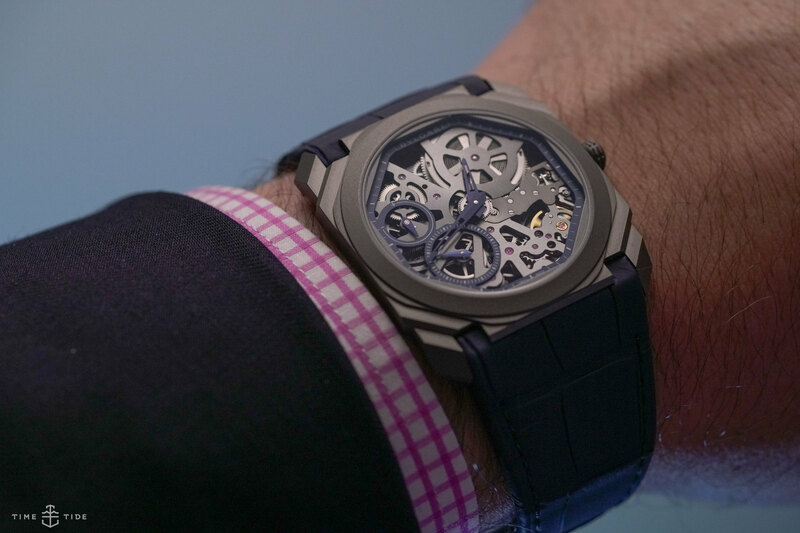 And one of this year’s barely-there hits sees the Octo Finissimo Skeleton – which we first saw in 2016 – made available in a titanium case and set off with surreal highlights of blue. This is going to sound cliché, but considering that the case design of the Octo is inspired by the uniquely octagonal lines of the Roman Maxentius Basilica, you’re going to have to bear with me. In its skeletonised form, the Octo Finissimo is pure architecture. The linear lines of its 40mm by 5.37mm thick case are only intensified by the geometric bends of the open-worked BVL 128SK movement inside. While manually wound, it does make this still-very-thin Octo slightly thicker than its automatic and closed-dial brethren (which measure 5.15mm), due to the addition of a dial side indicator that keeps track of its 65-hour power reserve while sitting neatly above the small seconds subdial. The big difference that sets this version apart, however, are the accents of blue that can be seen on its facetted and hollowed-out hands, as well as on the outer ring of the dial and subdials, and finally on the matching alligator strap. 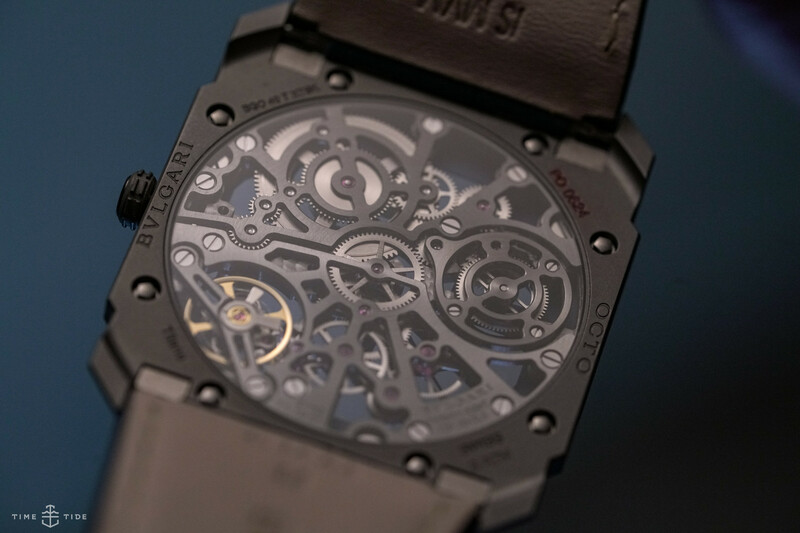 However, the multiple shades of grey still dominate, from the matt and sandblasted case, to the circular brushed and chamfering finishing of the movement’s bridges and plates. 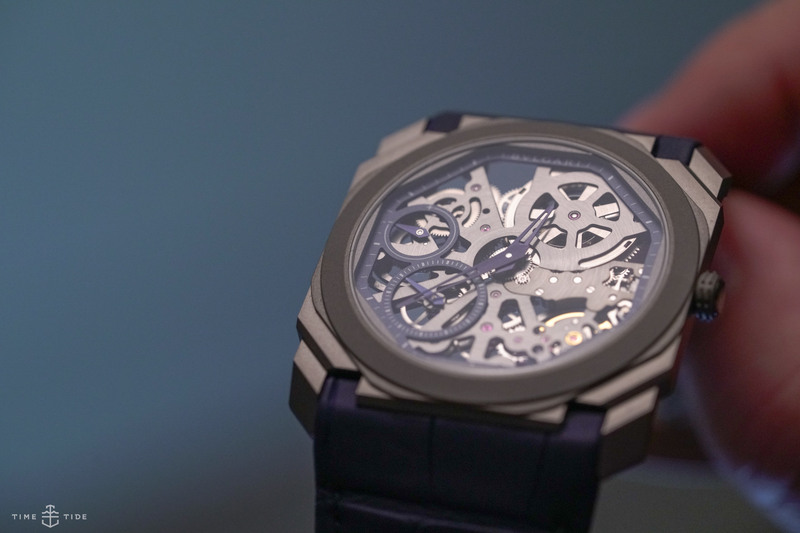 I’ve often said that the Bulgari Octo Finissimo collection must be seen to be believed. And never have I meant it more. 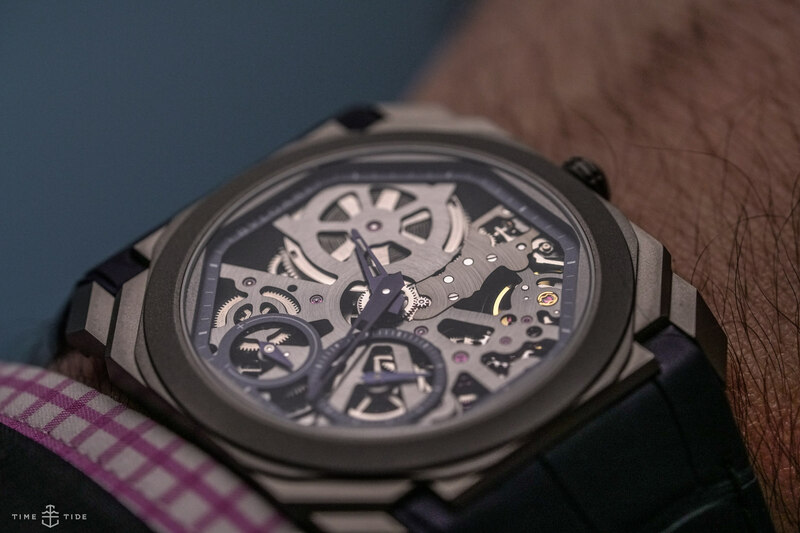 Especially when you flip the watch over, and that open-worked movement somehow becomes even more, well … open.